Always looking for the New York connection for Garden Bytes readers, of particular interest are pieces by Kukielski and Karl McKoy, curators of roses at the NYBG and Queens Botanic Garden respectively, and Stephen Scanniello, former curator of roses at the BBG, now President of the Heritage Rose Foundation. 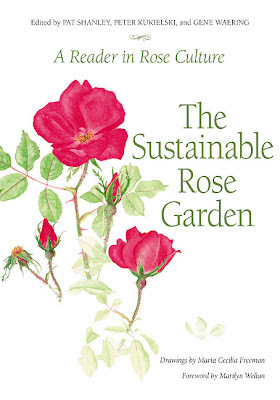 Other local gardeners Pat Shanley and Marjorie Marcallino have written pieces as well, but the book's crucial message of sustanablitiy applies to us wether the expert is from India or California. John Starnes a rose hybridizer from Florida, contributed "Probiotic Rose Growing" and offers a recipe for Poop Soup for roses. A necessary ingredient is a gallon of fresh horse poop. My immediate thought is that since I no longer have my farm, this ingredient will be impossible to obtain in Manhattan; second thought crowding in on the first is an image of me shovel in hand, on Central Park South & Fifth Ave. where the horse carriages await their fares. Can I add horse pooper- scooper to my current title of trash scavenger? This book of individual essays would be improved a thousandfold if there were an Index at the end. And Other Ellen will have to be the photographer.